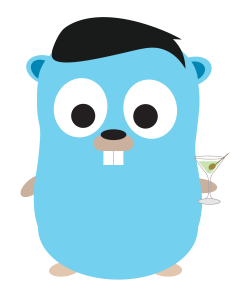 With Laragon, adding another Apache version is very easy. @pemakanwortel : Please make sure that your Apache version must match your PHP (TS) version in term of "Architecture (64-bit)" and "VC Build (VC14)". You didn't tell me your full Apache version so I can't tell you what's wrong. FYI: When I bundled Apache (httpd-2.4.27-win64-VC14) to Laragon 3.1.3, I saw no issue. @leokhoa is not working for me. @Katarina-Trajkovic : Can you show me some images? @leokhoa ok, I have a question. 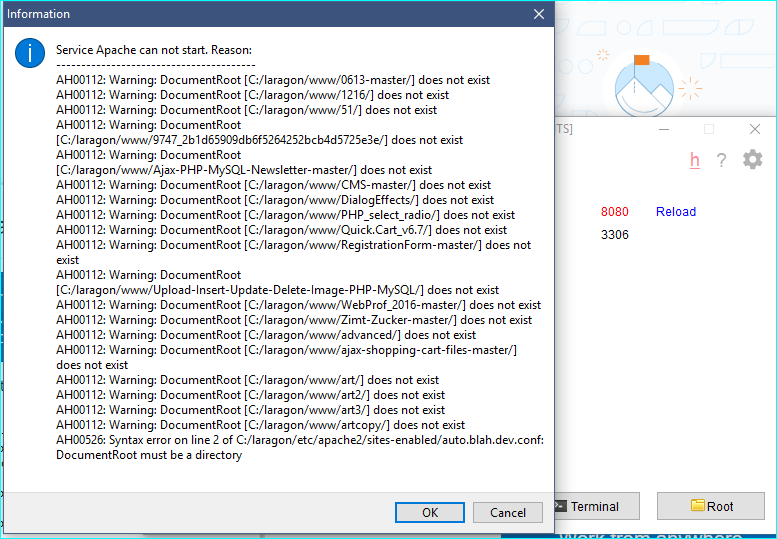 in this picture gives the files that I do not have in www. this are the old files. 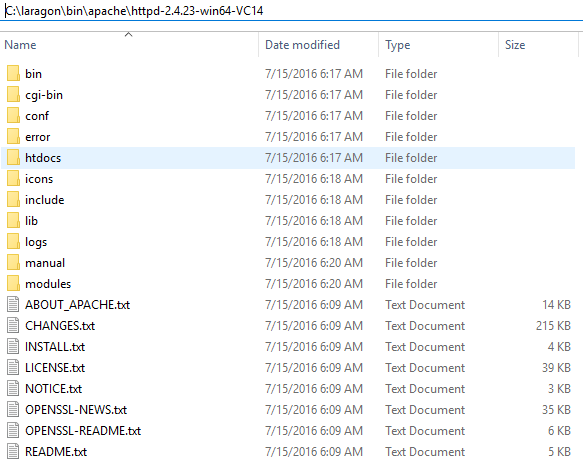 When I go to the apache VirtualHost, he gives me the lists of the names of these files. Is there a way to remove the names of these files? @leokhoa thank you, working perfectly. I had the same error message after downloading, extracting and choosing another Apache version. That was because I strictly followed your instructions about extracting the downloaded apache package. Because I needed to use php-5.6.37-Win32-VC11-x64 laragon instructed me that bundled Apache httpd-2.4.27-win64-VC14 doesnt match chosen PHP ( probably because different VC ) so I wanted to try httpd-2.4.34-win64-VC11 so I have downloaded it and extracted into bin\apache\httpd-2.4.34-win64-VC11 and then that error appeared. 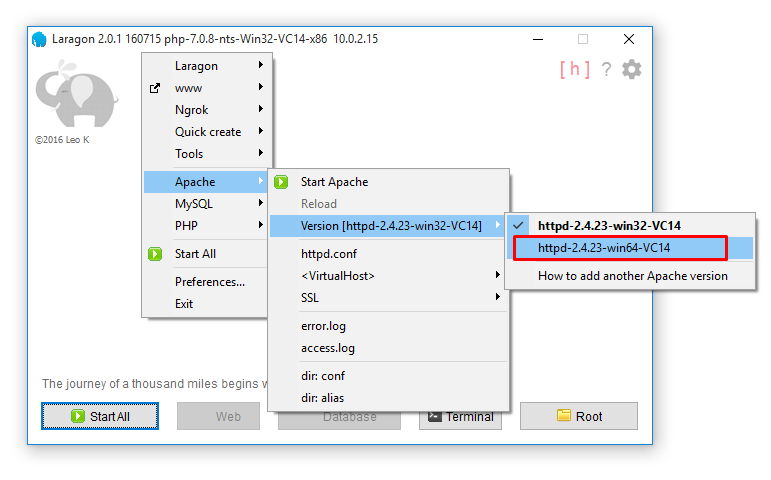 After while I noticed that there is Apache24 folder in that zip file, from which those files should be copied into httpd-2.4.34-win64-VC11 folder. But overall I had to admit that this is the best WAMP software which I tried until now ( I have used XAMPP for years, then paid MAMP PRO for 6 months ), so thanks a lot for this great software. I love how laragon automatically identifies laravel projects and set virtual host accordingly to public folder and how is everything fast, automatic and simple ( after while ) .